Zimbabwe has introduced its first ever 1,000-dollar bill - worth little more than one US dollar at the official exchange rate - to try and ease the country's chronic cash shortage. Long queues at banks have eased slightly since the issuing last week of short-term "bearer cheques" valued at up to Z$20,000, and of new-design Z$500 notes on Friday. But people are still spending hours trying to extract a few thousand dollars from their bank, in the face of hyperinflation which currently means prices are rising at more than 400% a year. The new note will form part of Z$2.5bn the government says it will inject into the economy every day from now until the end of the year. But while the new bill could help ease the banknote shortage, it is widely seen as no more than a stopgap. Although at the official rate Z$1,000 buys a little over one US dollar, the Reserve Bank of Zimbabwe's coffers are almost devoid of foreign currency. And, at the much more common parallel market rate, the new note will be worth no more than 25 US cents. Critics blame the devastation of the official economy - unemployment is at 70% and there are now no official petrol imports because the government cannot afford to pay for them - on the policies of President Robert Mugabe. They say his government's policy of throwing white farmers off their land has turned the country from the breadbasket of southern Africa into a land where millions are facing starvation. 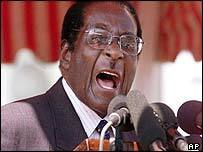 Mr Mugabe, on the other hand, says external forces - particularly the UK and the US - are conspiring with domestic opponents to sabotage the economy in retaliation for the land redistribution. In the meantime, the collapse of much of the official economy has led to some unexpected spinoffs. The Zimbabwe Stock Exchange has been shooting up, as companies continue to find buyers for their goods. A constant flow of remittances from the hundreds of thousands of Zimbabweans resident overseas is keeping many families going - and ensuring high liquidity for both the parallel-market money-changers and for the informal economy as a whole. At the same time, the fact that interest rates are way below the rate of inflation has led to an asset boom and a building frenzy in Harare. That still does not help the low-paid, however, since some companies are taking advantage of the fact that most wages are paid monthly. Even over a single month a firm can make a handy extra slice of money by delaying wage rises behind the pace of inflation.